Celia’s father Juan Lowry had returned from the war in Europe with money he won playing poker and bought Won’s on the corner of Riverside Drive and Knox before CalTrans built the Golden State in 1956, which eradicated, obliterated, razed, moved, ripped asunder, and demolished the mostly Latino Eastside near the River. The stretch of little commercial buildings except for Won’s sunk into desuetude. 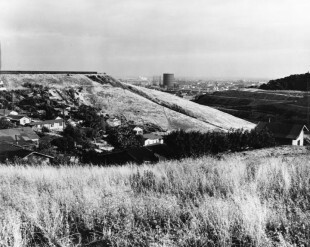 In 1964, CalTrans brought California Route 2 over Riverside Drive, which almost completely isolated Frogtown and surrounded it with incessant noise. His name was Juan and he had won at poker. He had thought the coincidence of names was a good omen. He was Juan of Won’s. She walked to the edge of the river and found her brother Malcolm near the bridge smoking a cigarette, and she pushed under his arm until he said “Mija,” and put his arm over her shoulder. The electricity transforming station was on the other side of the river and power lines led from the station to transmission cells on power pylons braced with metal Xs and set in concrete. Glassell Park was on the other side of the river, after that was Lincoln Heights and then Boyle Heights. The rusted inside of a box spring mattress was on the bottom of the river and it looked like the transforming station only smaller. The air was full of static electricity. The water smelled like fish and frogs. For one million years, the net of creeks that ran down from the Santa Monica and Verdugo Mountains had deposited alluvial sentiment 20,000 feet deep to make the riverbed. The dirt bank next to the levee grew hare barley, foxtail, fleabane, cockleburs and dandelions. In the weeds were old clothes and broken bottles of Thunderbird, Ripple, and Night Time Express. When the hobos that camped along the river went to Won’s, they said, “I’m taking the Night Time Express,” and Juan handed them their bottles. He thought they meant they were going to ride a freight car out of the train yard, which was the place where the settlers once planted corn to send to the San Gabriel mission, and through which still eased pottery sided remnants of the zanja madre. Toonerville was at the bottom of the Hyperion Bridge. Beyond Toonerville were Glendale and the mountains behind it. Frog Town was tucked in for the night along the river. Malcolm drove the Auto de Fe down Riverside to Figueroa to downtown and got on Pico Boulevard. Pio Pico was the last governor of Mexican California before the American takeover in 1846. Governor Pico was Mexican, African, Indian, and Italian, and he had looked like a black man. On the Indian side, Pio Pico was Malcolm and Celia Lowry’s great-great-uncle. The Boulevard started southeast of the old Plaza in the flats and went all the way to the ocean. Ranchero peons had loaded oxcarts with cattle hides and Indian laborers rode the carts through wild mustard as tall as a man on a horse the twenty miles to the ocean along that route. The Americans arrived and built brick stores and put in electric poles in the flats and Jews, Armenians, Russian Molokans, Chinese, Japanese and black people followed and planted vegetables around the houses in the open area that would one day be called “empty lots,” as if the highest measure of value for earth was to have a building on it. The populations were like the rivers running above and underground and meeting each other in confluences. After awhile, they passed a tall building with columns on the tenth story and blank windows below like a woman in a plain dress with an elaborate bodice, which stood where the pomegranate trees had been in the 1850s. Further west, there were more empty lots and then a former speak-easy, a hotel with Moorish spiral stanchions and Assyrian lions in profile, late nineteenth century commercial vernacular with medallions between windows, escutcheons, shields in surrounds of agapanthus, ornamental shields, armorial wings and then small stores made of brick with rooms on the second story where people lived. The stores became: pawn stores, a mechanic’s, a gas station, a store that sold only light bulbs. The negligent and frugal charm of the old buildings grew westward into flat stucco boxes without living quarters after the zoning laws of the late 1920s more rigorously separated commercial and residential areas and after the architectural movement to simplicity degraded to ugliness. An oil well stood at the corner of Doheny. Los Angeles rested on oil fields. Doheny and Canfield struck oil on Second Street near downtown in 1892. For years, derricks rose from backyards and lots and dominated large sections of the city. Behind Pico on the north and south residents of the houses and apartment buildings — some of houses were spacious mansions with expansive lawns, many of the other structures middle-class Craftsman bungalows – fed and clothed themselves from the commercial street. People walked, then, home from work, from home to the store. There were neighborhoods when the houses were new, everything drawn into the electric railroads’ web of right-of-ways and high wires. Bruno’s father took him on the electric car just once, just before Pacific Electric decommissioned it in 1955. His family had come from rural states in the middle of the nation, and his parents owned an automobile from the time of the hegira west from Oklahoma and Arkansas, but it was the electric car’s last trip, and the last riders filled the car as it went through Edendale to the Subway Building downtown to memorialize the end. The suburban and interurban red cars and the trackless yellow coaches had created the second dispersion of communities of people into neighborhoods where people lived isolated from each other. The first dispersion had occurred located when the city located slaughterhouses and garbage incinerator on the east side of what was then Los Angeles where the working people lived at the end of Zanja Number Nine, that deposited crap from the city’s sewage. When they got to the beach, Celia dove through the breakers and she emerged in the flat calm area where the water was glassy. Bruno came in after she did and swam away until she couldn’t see him. She saw him again not far from shore: he was entangled in seaweed. She swam to him. The seaweed was rubbery and smelled like iodine. She pulled his head under her arm and swam with him to shore. The ocean was almost the same blue as the sky and the light was so bright it obscured the line between the water and the sky. A ship moved through the light. It seemed as if the ship were flying. In early spring the Jade and Celia rode their bicycles up Chavez Ravine Road from Sunset Boulevard. The bicycles were heavy and had wire baskets in front of the handlebars. In the baskets rested pads of brown paper and crayons from the Woolworth’s on Fletcher Drive. They went down a deeply gullied dirt road and saw mailboxes standing on posts at the edge of the road, and they stopped and drew the mailboxes on the map they made of that day. Drizzle dampened their hair and sparkled their eyelashes with glitter. They saw an old wooden house, and a vine with white flowers veiled its porch. The children got off their bicycles and looked in the windows. The house was empty. All of the houses were small, and no one lived in any of them. The girls found a greenhouse with broken glass panes. They went inside but they found nothing but empty plank tables. They pushed the bicycles through mud to an orange tree orchard. No one had collected the winter fruit, which lay brilliantly on the grass. Jade bent and picked up one of the oranges and bit into it. The fruit tasted bitter. She threw it up high into the gray sky. The children watched the orange go up, quite high, and it reached its apex and seemed to stop there.